Lama Sangye Monlam was born in 1955 in the Khyungpo region of Kham (Eastern Tibet) into a family living the traditional life of half-nomads, half-farmers. In 1959, during the Chinese invasion, his father went missing, and for many years was presumed dead. Lama Sangye lived with his mother and siblings and was taught to read and write by his mother and an uncle. Between ages 9 and 12 he went to school, where there was little reading, writing and arithmetic and much slapping around of pupils. Between ages 17 and 22 he did road construction work (under very harsh conditions), while continuing to help his family with farm work. Then, aged 22-27, he worked as a yak-herd and shepherd in collectivized agriculture - a pastoral idyll in summer, but very hard in winter, living outdoors with the animals with hardly any shelter. In 1979, to Lama Sangye's great surprise and joy, a letter from his father - missing for 20 years an presumed dead - arrived, telling his family that he was alive in Indian exile, that he had become a monk in Menri monastery in Dolanji, and that he wanted his sons to come and see him. This journey to India took a few years to organize, but in 1982 Lama Sangye went to Dolanji together with a younger brother to see his father. He was overjoyed to find his father alive, and he met the 33rd Menri Trizin Lungtok Nyima Rinpoche, Yongdzin Tenzin Namdak Rinpoche and Tsedrug Khenpo Tsondru Rinpoche. He did a Mawai Senge retreat of one week and received the Mawai Senge empowerment from Menri Trizin Rinpoche. Then Lama Sangye went on a pilgrimage with his brother. Together they completed the Khora of Mt. Kailash 23 times, and one more time by prostrations. They also circumambulated lake Mapham three times. After returning to Dolanji via Dolpo in Nepal, he lived in Dolanji together with his father and brother happily for a year. When his father told his sons that one of them had to become a monk, Lama Sangye, at the age of 29, took vows from Menri Trizin Rinpoche and Lopon Tenzin Namdak Rinpoche and became a monk at Menri monastery. Thereupon, his father and and brother went back to Tibet. Lama Sangye then began drubdra (meditation school) at Menri under Tsedrug Khenpo Tsondru Rinpoche, who, however, died after the first year, when Lama Sangye had just completed Ngondro. He continued drubdra for another two years under the 33rd Menri Trizin Lungtok Nyima Rinpoche and Yongdzin Tenzin Namdak Rinpoche. During drubdra, he received transmission of (Shardza Rinpoche's texts) Kusum Rangshar and Kunsang Nyingthig (heartdrops of Dharmakaya) from Yongdzin Tenzin Namdak Rinpoche, and learned and practised Tsa Lung (Tummo), and Trulkhor (in the traditional way, doing a 100-day Tsa Lung/Tummo retreat) under Menri Trizin Rinpoche. Also during drubdra, Lama Sangye received empowerments of all 120 Bön Yidams. After Lama Sangye's third year of drubdra, he was sent together with the doctor Tsotram Sangye to the tiny monastery Tashi Gegyi Thadan Ling in Dhorpatan, a Tibetan refugee settlement in a remote area of Nepal, after an urgent appeal for help by the abbot Sonam Gyaltsen. At Dhorpatan, Lama Sangye was responsible for conducting rituals, leading recitations, and performing various rites for people who requested them. When Lama Sangye had been in Dhorpatan for two years, Lopon Tenzin Namdak Rinpoche went to Kathmandu and when, in 1987, he founded Triten Norbutse, Lama Sangye joined him to help. Thus he has been active in building and constructing Triten Norbutse monastery in Kathmandu from the very beginning. Under Yongdzin Tenzin Namdak Rinpoche's instruction, he studied and practiced all Bon rituals and recitations and especially the ritual music in a profound way for about two years, and then worked as a Nyerpa (manager) of the monastery for seven years, while continuing to attend Yongdzin Tenzin Namdak Rinpoche's teachings on Dzogchen, Tantra and Sutra, typically for 2 hours a day, without any days off. Lama Sangye relates how Yongdzin Rinpoche used to joke with his students, saying: "you can take a day off - I will continue teaching!" At some point, Lama Sangye did three months of Sherab Jyamma retreat. Then, Lama Sangye started the meditation curriculum "drubdra" a second time, in Triten Norbutse, and this time completed all four years, finishing in 2000 and receiving his Drubthonpa diploma from Yongdzin Tenzin Namdak Rinpoche at the beginning of 2001. During drubdra he received transmission of all four great Dzogchen cycles of the Bon tradition (and of many additional texts and practices), training in the traditional way of "hearing, thinking, practising". He completed the 100 day Tsa Lung (Tummo) retreat a second time and did the 49 day dark retreat. Just after completing drubdra, Lama Sangye did another three months of Sherab Jyamma retreat. In 2001, Lama Sangye Monlam was sent to Normandie in France, together with Geshe Gelek Jinpa and one other monk, to demonstrate to western science (represented by Harvard researcher Dr. Herbert Benson) the effects of Tummo. In this setting, as a research subject, Lama Sangye completed the 100 day Tummo retreat for the third time in his life. Afterwards, back in Nepal, Lama Sangye spent a year travelling, visiting Dhorpatan again, among other places. Back in Triten Norbutse monastery, he worked in the household of Yongdzin Tenzin Namdak Rinpoche, cooking for him and Khenpo Tenpa Yungdrung Rinpoche. At some point Yongdzin Tenzin Namdak Rinpoche told Lama Sangye: "now you have to go into retreat again". Accordingly, Lama Sangye went into Drenpa Sangdrub (secret practice of Drenpa Namkha) retreat, where, for four years, he practiced the four generosity rituals every day and spent the rest of the day in meditation and Drenpa Namkha practice. In 2007, after four years of Drenpa Sangdrub retreat, Lama Sangye was sent by Yongdzin Tenzin Namdak Rinpoche to Shenten Dargye Ling in France, where he is still living as a resident Lama. Though living in France in recent years, Lama Sangye manages to visit Triten Norbutse from time to time and also teaches in other European countries, in particular in Austria, the Netherlands, Poland, the Czech Republic and Bulgaria. 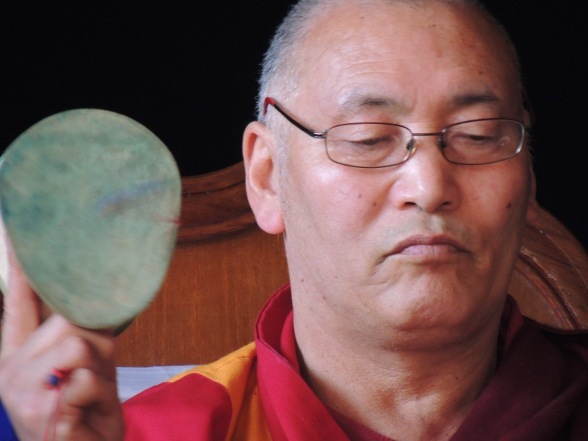 In Fall 2011, Lama Sangye Monlam taught the 10 weeks of Tsa Lung, Tummo and Trulkhor that constituted the third year of the first gomdra cycle in Shenten Dargye Ling.